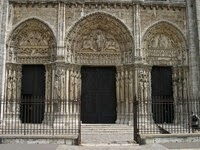 History and Gothic Architectural Design of French Basilica. medieval art of the 12th century. Chartres Cathedral, perhaps even more so than Notre-Dame Cathedral in Paris (1163-1345), is generally considered to be the greatest and best preserved example of Gothic architecture in France. Located roughly 80 kilometres southwest of Paris, the Basilican cathedral was largely built between 1194 and 1250, and was the fifth cathedral to stand on the site - a site revered by both Romans and Druids - since the 4th century. The cathedral is world famous for its glorious stained glass art, and for its rich array of gothic sculpture, whose exact meaning is still pondered by scholars. With a 34-metre high vault - 4 metres taller than the ceiling in Notre-Dame - and walls almost entirely made of stained glass, Chartres Cathedral exemplifies the improvements offered by Gothic art over the previous style of Romanesque Architecture (c.800-1200). It continues to receive large numbers of Christian pilgrims - no doubt attracted by its famous relic, known as the "Sancta Camisa", the tunic worn by the Virgin Mary at Christ's birth - as well as tourists attracted by the cathedral's architecture and stone sculpture, as well as its three huge rose windows. 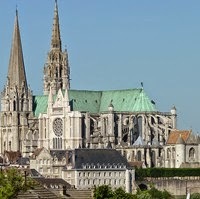 In 1979, Chartres Cathedral was added to the UNESCO World Heritage List of culturally important sites. The cathedral represents the true prototype of the Gothic cathedral characterized by a longitudinal body with a nave and two aisles and an elevation on three levels - arcade, triforium, clerestory - crossed by a short transept and ending in a deep presbytery with ambulatory and radiating chapels. The cathedral is roughly 130 metres (430 ft) in length, and its nave is 16.5 metres (55 ft) wide. Its cruciform design plan - typical of French Gothic Basilicas, and similar to those of Amiens and Reims - includes a two bay vestibule (narthex) at the western end leading into a seven bay nave up to the crossing with its three-bay transepts. The heads of the transept end in a richly decorated projecting atrium above which a series of fine lancet windows connects to rose windows, creating an extraordinary luminous surface that opened the way for the later transepts of St Denis and Paris. The burning down of the Romanesque structure and then the first Gothic structure, meant that the new cathedral was entirely Gothic, harmonious, balanced and all of a piece. 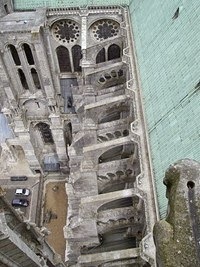 As a result, the cathedral exemplifies the Gothic values of height and height, which were only realized because Gothic architects managed to channel the weight of the ceilings and walls to specific points externally reinforced by heavy flying buttresses and supporting piers, thus minimizing the load on the walls. Consequently, not only could the ceiling be higher (and more awesome) but also the walls could house much bigger (and more inspirational) stained glass windows. And more glass meant less Romanesque-style gloom but lots more Christian art for worshippers to enjoy. Amazingly 152 out of the original 176 stained glass windows, installed 1205-40, have survived: a unique occurrence for a medieval cathedral. Note: The great German Gothic structure of Cologne Cathedral has a window surface area of 10,000 square metres - roughly three times larger than the area of glass at Chartres. Gothic architects and sculptors sited most of the cathedral's narrative sculpture around its entrances and doorways, known as "portals", and Chartres is no exception. The three portals of the west facade contain a virtual encyclopedia of Biblical art: each doorway focusing on a different aspect of Christ's role. Around the doorway on the right, the sculpture depicts his earthly life, and includes scenes like the Annunciation, Visitation, Nativity, and the Presentation in the Temple. On the left, we see the Second Coming of Christ (some experts understand this to be the Ascension of Christ). The centre portal illustrates the End of Time as laid out in the Book of Revelation.  For more about the architecture of Gothic cathedrals in France, see: Homepage.